Recently I’ve had the chance to give some talks on the history of trade infrastructure, bills of lading, factories, and the intellectual history of “supply.” I shared a similar version of this talk at both the Neil Postman Conference and the Media, Materiality, and Infrastructures workshop here at NYU, so I thought I’d do so here. Thumbnail in the Biblia figurata made ​​for the Raphael Mercatellis, Gent, late 15th century. Ghent Cathedral, Ms.. 10, fol. 74. 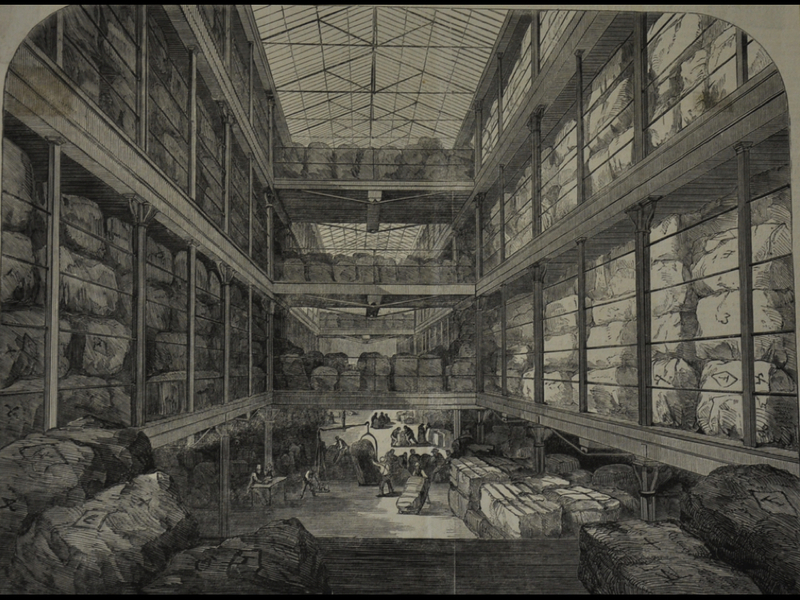 The American Warehousemen’s Association begins one of their own histories with the Biblical story of Joseph, and of his illumination of Egypt with the material mechanisms of containment and preservation. In their account Joseph is revealed as both a fellow businessman, and—through the preparation of supply—a “master” of men. Quoting From Genesis: 41:35, 36. Traveling the Road of Logistics: The Evolution of Warehousing and Distribution, The American Warehousemen’s Association, 1991. The historicity with which Heidegger imbues his account, however, is a particular one. It is in the formulation of modern technology, science, and physics through which nature is set to “exhibit itself as a coherence of forces calculable in advance,” where the world is ordered to report itself as the chief “storehouse” of the standing-reserve. I would offer a more mundane, material, origin for a moment when nature becomes present “exclusively as standing-reserve.” The material realization of the standing-reserve is that way of imagining and ordering which stands in for the possibility of action, ready as a imagined category of ordering for future potentialities. I’d like to suggest its location in the factory, in the wharf, and the warehouse. I’d like to begin by examining the formation of the factory—and here, I mean the house of the factor rather than the home of machines—as an institution in the seventeenth and eighteenth centuries. “The Wool Warehouse.” The Illustrated London News, August, 1850. Any discussion on the role of the factory in the history of global exchange has the potential to be eclipsed by the prominence afforded its polysemetic compatriot in the history of global production. In his 1886 “history of the factory system,” an inspector of that latter object, Richard Whately Cooke-Taylor, considered the dramatic changes in the nature of manufacture since the industrial revolution. He begins with the suggestion that it is surprisingly uncertain “at what period precisely the term ‘factory’ lost its primary and acquired its present meaning.” This primary meaning, of an establishment, “not for the production of commodities, but for their exchange” is comprised of the “buildings and bodies of traders” who have been planted “in the dominions of countries well acquainted and at amity, for purposes of mutual convenience.” He suggests that the growth of these establishments fomented a kind of colonialism by accident, where “native communities [had] voluntarily placed themselves under the rule of the residents at a factory, and so thrust sovereignty upon them.” In his effort to sort the originary grains of industrial site from the chaff of the trade post, however, he seems to protest too much any similarity between the two. The modern factory, he notes, is a place “where certain productive operations are performed” by various “mechanical and intellectual organs, acting, in uninterrupted concert, for the production of a common object.” Comprised, he suggests, by the “marshaling of human beings in systematic order.” While our factory inspector takes from this meaning a means of differentiation, the factory as the center of trade offers a rather apt analogue to the definition he offers to distinguish from it. What kind of objects, if there is even more than one, are being produced here? These environments were more than mere sites of exchange. As sites of production in their own right, they furnished not only the raw materials, but the configurations of communication whose logics wrought new kinds of commodities alongside new perceptions of materiality—all enclosed within the totality of the objects housing their production. 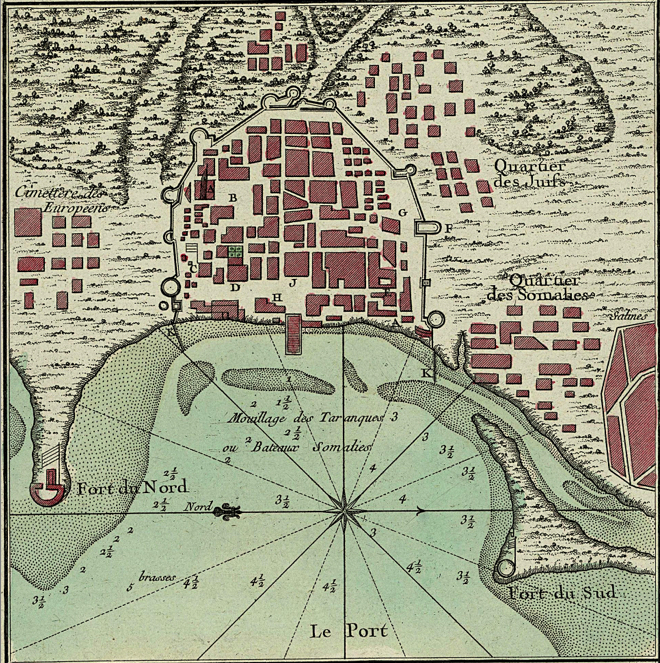 Plan de la Ville de Moka [City Map of Mocha], by Jacques-Nicolas Bellin, Le Petit Atlas Maritime III, pl.20, 1764. Showing the locations of the Dutch (C), the English (D), and the French (E) factories. Through these factories the great chartered joint-stock companies oversaw an expansive trade in a moment of severe geographic and temporal detachment. Traders set out to ports thousands of miles across vast and unfamiliar oceans, transforming their vessels into mobile vehicles for the transfer and translation of innumerable combinations of paper and people alongside their material merchandise. With the interregnum between Europe and the East, any kind of practical flexibility remained in the hand’s of the company’s seafaring and stationed subalterns. The factors, agents, and merchant traders stood at the ends of pathways of trade that been carefully charted only within the last century. Their presence was both the cause and effect of a steady transformation in the logic of exchange, and the history of this transformation in the mediative mechanisms joining Europe with the commerce of the East can be found within the gradual evolution of only a few material structures. The history of trade had been defined by risk, commitment, and time. The pattern may seem obvious. Merchants would arrange to send cargo or bullion to purchase local goods for import or to leverage in further transactions. While they may have already a local buyer prepared through past correspondence, even in the eighteenth century merchandise was often sent speculatively, with the means for their disposal placed in the hands of ship captains, stationed operatives, or trusted partners. When merchants remained the masters of their own ships, they had been “peregrenators,” moving constantly in an “unending pursuit of profit.” Among the merchant houses of the thirteenth century Mediterranean, however, a new kind of commercial actor emerged. These “sedentary merchants” were able to leverage capital reserves to enroll other actors in their pursuits. 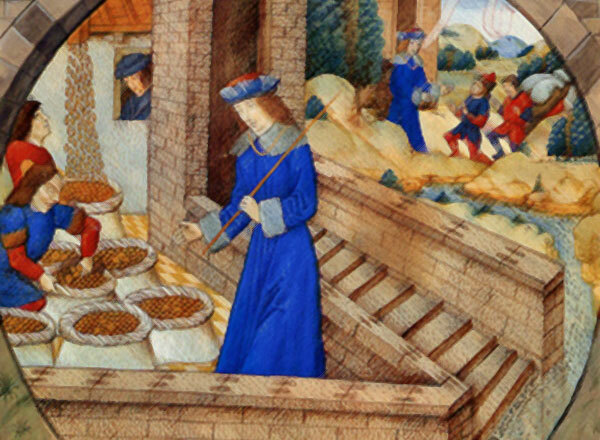 ￼Although remote colonies and trading posts had always been a fixture of exchange, “factories” as a particular kind of organizational institution are most closely associated with late medieval Europe. More than the crossroads of exchange, they were sites for the organized dispersion of pre-collected commodities from one geography to another. It was the Portuguese who had first mastered the methods of long-distance navigation in the 15th and 16th centuries. Driven by profit and opportunity, their ships were bound up by technologies of control as they were drilled into relentlessly precise vessels of action. The Portuguese vessel was, in the words of John Law, undisturbed by its environment “only so long as they were able to transfer that environment inside themselves in the form of charts, rutters and the rest.” They had established the first factory on the coast of Mauritania in 1445. This site, like that of the other Portuguese feitorias, was a combination market, warehouse, and way station overseen by a feitor trading on behalf of the crown. While initially responsible for only for the most basic of details concerning the storage and shipment of merchandise, by the eighteenth and nineteenth centuries, the factor’s responsibilities could vary considerably. The factor being an agent residing abroad for a merchant or merchants. Very often these were former apprentices (sometimes they were ‘apprentice factors’, that is apprentices in their fifth or sixth year of training) who in some cases eventually acquired enough capital to establish themselves as merchants in their own right. The factor’s job was to buy and sell commodities for whomsoever he represented on the most favourable terms and to ship goods home. Naturally this required knowledge of local markets and trading conditions, foreign exchange matters, and book-keeping. Duplicated by the press of discovery, factories proliferated as armed outposts were ripped from native landscape to provide channels of exchange of between European companies and local populations. Individual implementations of the factory system took many forms. The Portuguese routed ships through their outpost at Goa, a kind of centralized structure imitated by the Dutch in Batavia. As a general description, however, factories were independent bases of operations whose expansion coincided with the emergence of the chartered companies, offering the security which allowed their temporary inhabitants to govern vast networks of trade with a minimum of human and nonhuman resources. While they were not intended as permanent structures, they increasingly became so—militarized towards European conflict, redirecting local sites of exchange to broader markets, and developing into centers of sprawling colonial empires. Once established, factories pulled competing European interests to their shores, and the early Portuguese factories were soon co-opted by a second wave of trade expansion from the Dutch, the French, and the English. While the navigation of the Portuguese had relied on a “black box that might be carried anywhere,” the companies of the seventeenth century had become more carefully attenuated to this environment, and these boxes could be opened up, spilling European environments and sociality into unfamiliar geographies. Whereas the age of exploration had necessitated constraint, the cargo hold of an East Indiaman counted among its contents not only the necessities of navigation, but men and materials bound for deployment in service abroad. Prior circuits of trade constrained by the act of circulation now found immobile enclaves at their ends primed by newly cosmopolitan competition from other European companies. In the ancient struggle for long distance control, they installed new mechanisms for remote operation. While the creation of document forms like the bill of lading separated merchants from the spatiality of transactional responsibility, the factory and the warehouse continued their separation from its temporality. Factors would fill their factories throughout the season, buying and stockpiling in advance of the next arrival. No longer would business be confined by the simultaneity of exchange at a fixed point in time. In the factory, mercantile practice which had been an act of contemporaneous communication is now assembled as something altogether different. 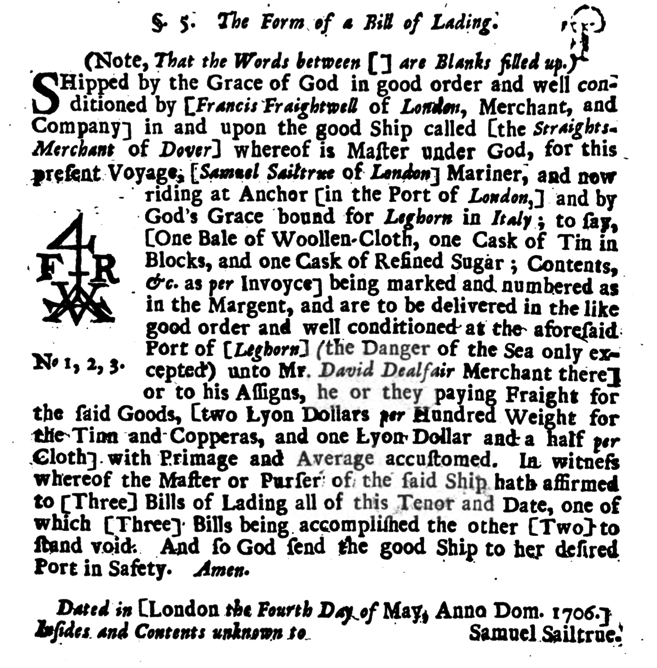 “The Form of a Bill of Lading.” Edward Hatton, The Merchant’s Magazine, London, 1719. Chiefly Calicoes, Canes, Cottons, Velvets, Silk, Taffeta’s, Carpets, Muslin, Indigo, Aloes, Satins, Saltpeter, Spices, Amber, Borax, Ambergreece, Rhubarb, Worm Feed, Sal-Armoniac, Rice, Tea, Fans for Women, Cornelions Rings, Aggats, Rough Diamonds, Pearl, China-Ware, Cocoa Nuts, Cinnamon, Ginger, Pepper, Cassia, Gold and Silver, Proceline Earth, Bengales and Alabaster. Chief towns of trade are (on this side the peninsula or nearest part of India, on the Malebar Coast) Surrat, Bombay, Cambay, Goa and Daman; and on the father side the peninsula, on the Cormandel Coast, etc. The chief towns are Fort St. George, Bissnagar, Maliapur, Negapitan; Hughley, Belescar, and Agra the seat of the Great Mogul: Also Achin, Benicouli and Indrapore. English Factories on the Coast of the Island of Sumatra, which (tho’ near) are not in the Territories of the Mogul. This country of the Mogul’s Empire is about 19 times as big as England. Edward Hatton, The Merchant’s Magazine Or The Trades Man’s Treasury (London: Coningsby, 1719), 223. As warehouses became stocked with the ready resources of their established locales—and the mental and material mechanisms of organizing the socialites surround them, they wrought more regular reserves of material supply, and (semi) reliable operators to correspond with. With this regularization came a corresponding systematization of demand. Factors and factory warehouses found their counterpoints in the dockworkers and candle auctions that would come to populate the shores of the Thames, the latter organizing demand where the former had fostered supply. “The Great Tobacco Warehouse at the London Docks,” The Illustrated London News, January, 1856. Now you meet a satin-waistcoated mate, or a black sailor with his large fur cap, or else a Custom-house officer in his brass-buttoned jacket. This immense establishment is worked by from one to three thousand hands, according as the business is either brisk or slack. … Polish refugees, broken-down gentlemen, discharged lawyers’ clerks, suspended Government clerks, almsmen, pensioners, servants, thieves- indeed, every one who wants a loaf and is willing to work for it. The London Dock is one of the few places in the metropolis where men can get employment without either character or recommendation. The nature of trader had been transformed from one of exchange. While the merchandise of merchant associations in the fifteenth and sixteenth centuries then remained “mere stock,” the chartered companies which followed seem to have produced something else. In the factories of the East Indies, not only does the material substance of the world stand at-the-ready, so does, for the first time, the shadow of the world system into which it is set. If this is simply an efficient ordering of supply, it now begins to emerge as the only category capable of ordering. Without this material instantiation of the standing-reserve, how could we explain the events which would follow? While the trade in the east had the mundane effect of un-concealing the lands and resources encountered there, it was the particular method of trade that followed which had the transcendental effect of revealing future possibilities detached from them. Factories seem not only to stockpile materials, they supplied the machinery for a transformation of exchange with profound impact on the organization of material distribution throughout the world. Within the factory walls, merchants became suppliers. Merchandise became supply. In this sense the warehouse, these sites of storage and supply, becomes the only relevant object, both revealing and hiding that within as the singular artifact of supply. It is a site of deobjectified, deculturied, degeographied reserve. Things, and even people, become relevant only in relation to it. They are available. They are in stock. They are out of stock. While Joseph was content to become a master of men, Heidegger goes father. It seems as though man everywhere and always encounters only himself. Can it be that man everywhere and always can only look to encounter himself? This entry was posted in Writing and tagged factory-system, heidegger, logistics, mechanization, warehouses. Bookmark the permalink.